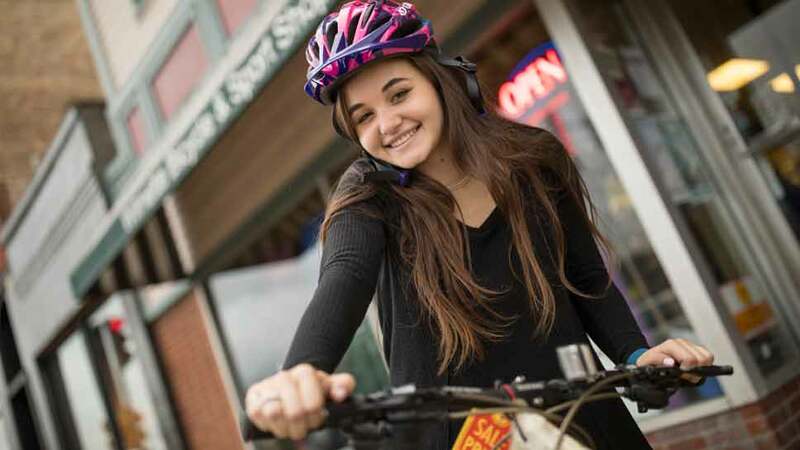 WILMETTE – What began as a third grader’s charitable idea has grown in the last 10 years into Pedal Power, a charity started by Wilmette resident Nicole Basil that collects and donates used bicycles. “My little third grade mind without any limitations said, why don’t we start our own charity?” Basil, who is now a senior at New Trier Township High School, told DailyNorthShore. Basil and her younger brother Bennett were thinking creatively about how to find a home for bicycles they had outgrown. 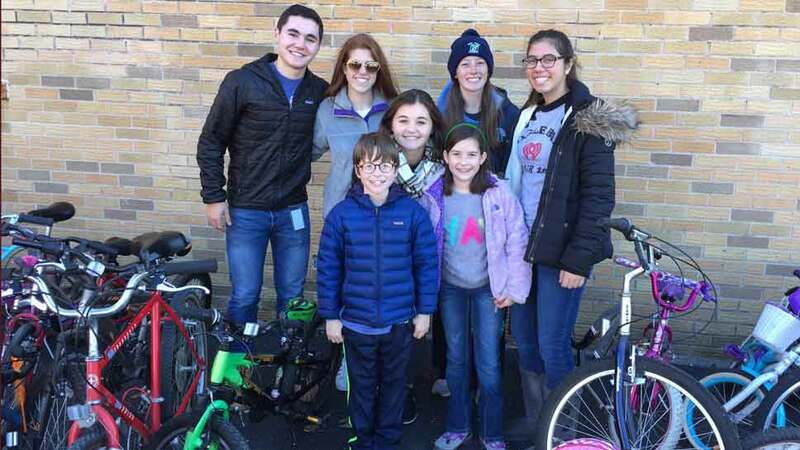 The first year, Basil was shocked when they collected 250 bicycles at Wilmette’s McKenzie Elementary School playground, where she was a student. “That first year I thought we would get 20 or 30 bikes, but they just kept coming in. 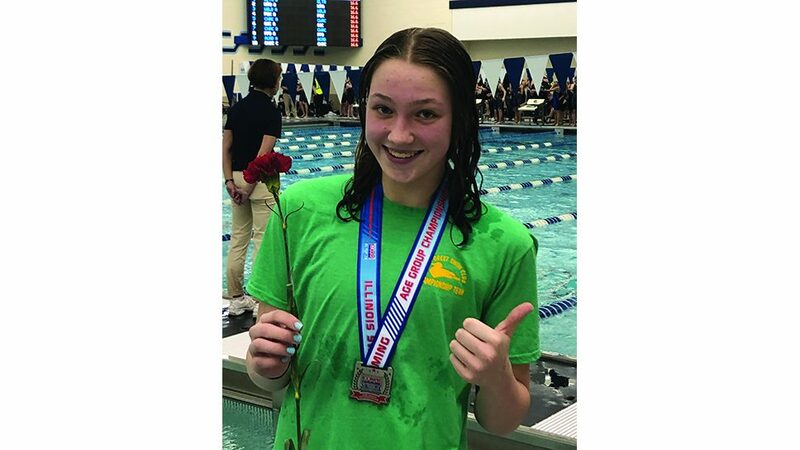 It was amazing to see people will to help out,” she said. People are still willing to help out and on November 11 from 9 a.m. to noon, Basil and other volunteers will once again be collecting bicycles for charity. 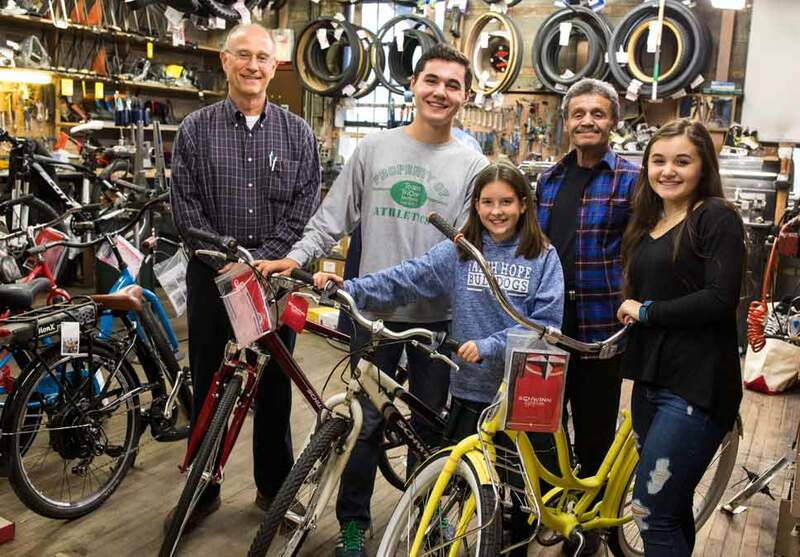 Wilmette Bicycle & Sport Shop owner Larry Versino, Bennett Basil, fifth grader Meg Erickson, bike shop chief mechanic Carlos Cotto and Pedal Power founder Nicole Basil. Nicole Basil surrounded by donated bicycles during the first Pedal Power collection, when she was 8 years old. Every year Pedal Power has broadened its reach, adding a new collection station in another suburb. 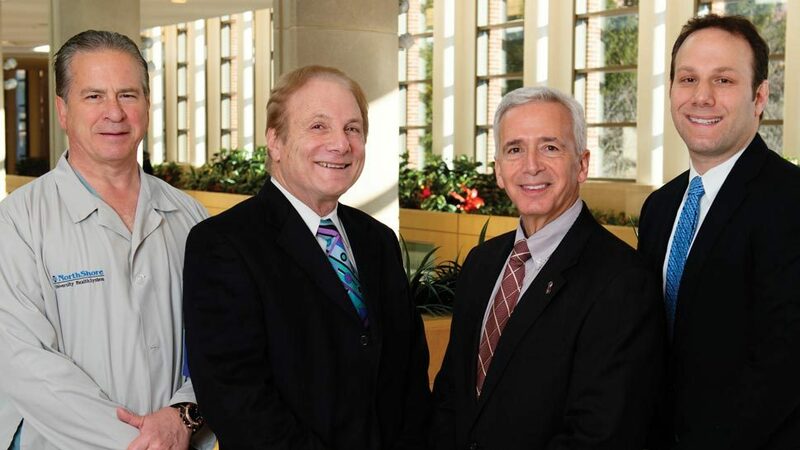 In addition to Wilmette, collection sites can be found in Northbrook, Glenview, Lake Forest, Evanston, Skokie, Libertyville, Palatine and Elmhurst, the latest community to be added. Visit Pedal Power’s website to learn more about the locations. Basil hopes to get more young people involved with the charity, encouraging them to start a Pedal Power in their own hometowns. “It is how it will continue to grow in the coming years,” Basil explained. Since it began, Pedal Power has collected more than 3,000 bicycles. 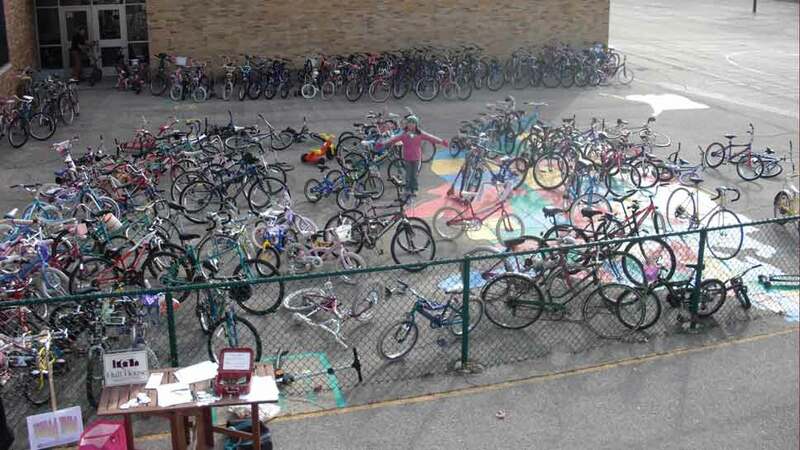 The bikes are inspected and donated to Chicago Public School students as a reward for making the honor roll. This year Cesar E. Chávez Multicultural Academic Center, a kindergarten through eighth grade school in Chicago, will receive the bicycles. The school was chosen because its students were working hard to improve their test scores, which were low within the district. But the scores have gone up significantly, according to Basil. “I’d like to think that had something to do with Pedal Power,” she said. This year Chicago’s ride share program Divvy Bikes is helping out Pedal Power. Divvy Bikes has offered to use its trucks to transport bikes to Cesar E. Chávez, as well as provide some publicity for the event. While Pedal Power seeks gently used bikes that are in good condition, every year some damaged bikes are donated to the charity. Those bicycles are donated to the North Side Learning Center, a Chicago public high school for students with special needs, which has a vocational bicycle repair program. North Side uses parts from the broken bikes for repairs. “Every bike gets to go somewhere and gets to be re-used and recycled,” Basil said. Running a charity 10 years straight is a long time, but Basil still looks forward to it every year. “I could not imagine my life without it. Every fall is Pedal Power season,” she said. Attending award ceremonies at Chicago Public schools and witnessing students’ reactions when they see their new bikes keeps Basil motivated. Being rewarded for hard work is a value Basil’s family shared with her and she is happy to pay it forward. Now that she is thinking about college and her own future plans, Basil is considering becoming an engineer. She still likes the idea of creating something new. “I saw one of my ideas come to life at a very young age,” she said. What’s next for this entrepreneur? She is in the midst of college applications, and hopes to study engineering. For more information visit www.gopedalpower.com. 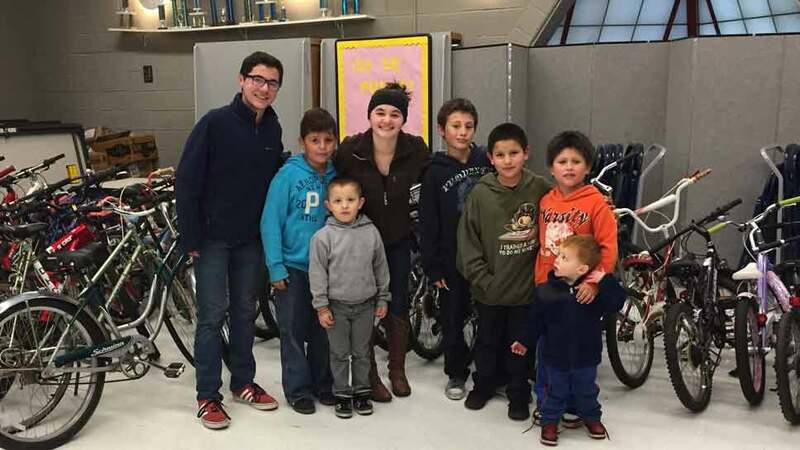 Bennett, left in a blue jacket, and Nicole, center, with bike recipients in 2014, when she was age 13. 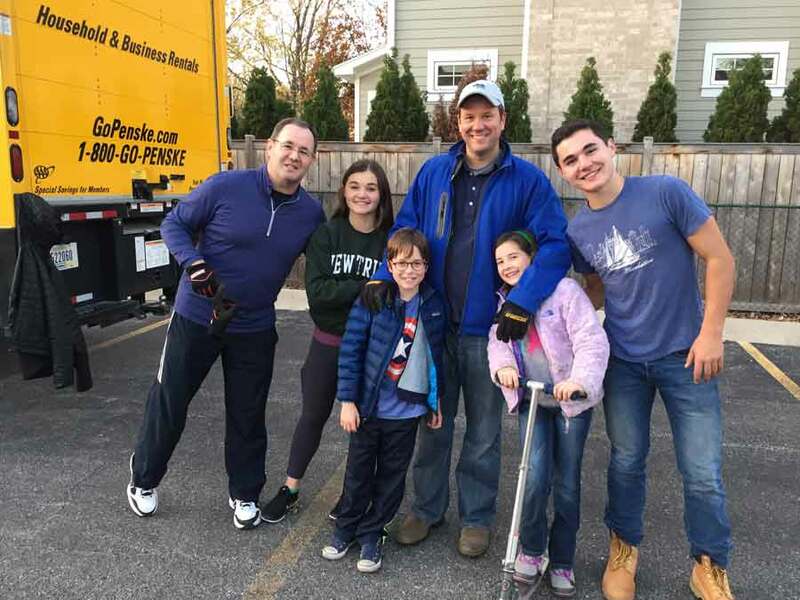 In 2016: Nicole’s dad, Mike Basil, Nicole, age 15 and wearing a New Trier green sweatshirt, Matty Erickson, Lucas Erickson, Meg Erickson, who will be taking over Pedal Power when Nicole leaves for college, and Nicole’s brother, Bennett.